“Come climb me!” In Tokyo on clear winter days, the distant snowy peak is a natural work of art between the tall buildings, tempting people to make summer plans to hike up and stand at the highest place in Japan. Top: Climbers are generally short of breath by the time they reach this point, and the summit is still a long way off. 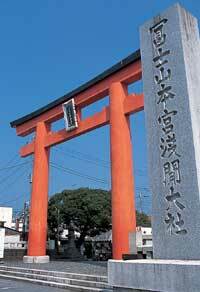 Above: A torii gateway erected by Fuji-san Hongu Sengen Shrine. A shrine was established here in the early 9th century at a time of frequent destructive eruptions, to pacify the mountain spirits. 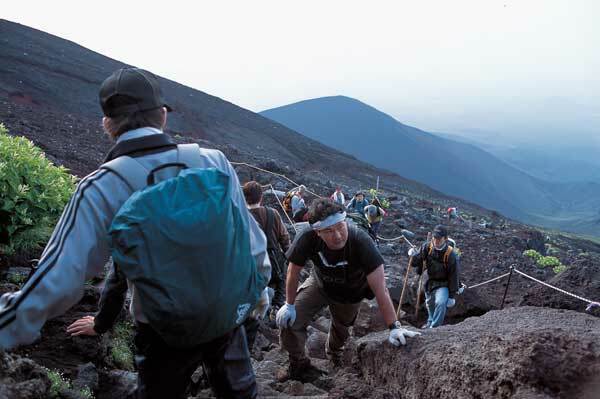 About 300,000 people climb Mount Fuji every year during the climbing season in July and August. What is the big attraction? To find out, I decided to go up myself right to the top. I had no experience in highland trekking, but I felt I was ready to tackle Japan's highest peak. It was a beautiful day in August. I arrived at the foot of Mount Fuji, and my first stop was Fuji-san Hongu Sengen Shrine, to make a wish for a safe climb. Next, I took the 11 o'clock bus from JR's Fujinomiya Station. It was full of climbers like myself, even though it was a weekday. The bus wound its way for two hours up to Shin Go-gome (the new fifth station). This is the end of the bus route, and the start of the Fujinomiya trail to the top of the mountain. The elevation there is 2,400 meters. It was a perfect day for climbing, and I saw a hostel near the top of the mountain. Actually, it looked encouragingly close. I ate lunch, stretched my muscles a bit to warm up, and began hiking up slowly.